Before discussing the fascinating congenital heart defect of ventricular inversion, a definition of terms is essential, particularly in reference to the 2 ventricles. This article refers to right and left ventricles based on their specific anatomic characteristics and not on their spatial relationships (ie, on the right and left sides of the body). The right ventricle is tubular, with its inflow portion separated from its outflow portion by the muscular crista supraventricularis (conus). Its ventricular septal surface is coarsely trabeculated; the inflow (ie, tricuspid) valve has 3 leaflets and associated papillary muscles, including a papillary muscle attached to the conus. The left ventricle is cone shaped with its inlet valve and outlet valve in continuity. Its ventricular septal surface is finely trabeculated; the inflow (ie, mitral) valve has 2 leaflets and 2 papillary muscles with no septal attachments. Therefore, a ventricle is named right or left only on the basis of its anatomy. The reader must keep this essential point in mind. The atrioventricular (AV) valves derive embryologically, in significant part, from the wall of the ventricle into which they enter. An AV valve entering a right ventricle has the morphology of a tricuspid valve, and an AV valve entering a left ventricle has the morphology of a mitral valve. For the purposes of this article, transposition of the great arteries refers to their anteroposterior (AP) interrelationship. See the image below. The aorta lies anterior, and the pulmonary trunk lies posterior. This definition is neither comprehensive nor uniformly accepted. Similarly, the right and left atria can be identified solely on the basis of their anatomic characteristics. This article refers to these structures on this basis. Ventricular inversion refers to a specific congenital heart defect in which the ventricles are exchanged in position so that the left atrium enters the right ventricle and the right atrium enters the left ventricle. In regard to the person's body and in the absence of other abnormalities affecting chamber position, the left ventricle lies primarily to the right of the right ventricle. The term ventricular inversion includes understanding that the aorta arises from the right ventricular outflow tract in a position anterior to the pulmonary trunk that arises from the left ventricle (ie, the commonly accepted elementary definition of transposition of the great arteries). As described below, a natural consequence of ventricular inversion results in the aorta arising from the right ventricular outflow tract anterior to the pulmonary trunk that arises from the left ventricle; in other words, the great arteries are transposed. Just as the term normal heart includes the pulmonary trunk anterior from the right ventricular outflow tract and the aorta posterior from the left ventricle, the term ventricular inversion includes an aorta anterior from the right ventricular outflow tract and a pulmonary trunk posterior from the left ventricle. Transposition of the great arteries is inherent in ventricular inversion and does not represent an additional abnormality. At the beginning of 4 weeks' gestation, the embryonic heart includes the primary heart tube that eventually forms the ventricles, their outflow tracts, and the proximal great arteries. This initially straight structure, fixed at its ends, grows more rapidly than the pericardial cavity in which it lies and, as a result, it must bend. This results in a C-shaped loop with the convexity directed anteriorly and rightward. It places the left side of systemic venous flow entering the heart tube in relation to the initial portion of the heart tube, the component that forms the left ventricle. With division of the AV canal, the right side of the entering systemic venous flow (ie, right atrium) aligns with the second portion of the heart tube (ie, the portion that forms the right ventricle). Normal septation of the distal portion of the heart tube aligns the aorta with the left ventricle and the pulmonary trunk with the right ventricle. Critical to this process is bending of the heart tube to the right, so-called d-looping. This is not a random process. The precise definition of what controls d-looping remains obscure but is probably genetically determined. Ventricular inversion results from bending of the heart tube to the left, so-called L-looping. If cardiac development otherwise proceeds in usual fashion, the right side of systemic venous inflow (ie, right atrium) aligns with the initial portion of the heart tube (ie, left ventricle). With division of the AV canal, the left atrium aligns with the second portion of the heart tube (ie, right ventricle). The process of division of the distal portion of the primary heart tube (ie, truncus arteriosus) into the aorta and pulmonary trunk remains somewhat controversial, particularly in regard to the development of isolated, simple transposition of the great arteries. However, all agree that d-looping with subsequent normal cardiac development results in the pulmonary trunk arising from the right ventricle anteriorly to the aorta that arises from the left ventricle. Simple transposition of the great arteries in d-looping results in the aorta arising from the right ventricle anteriorly to the pulmonic trunk that arises from the left ventricle. In L-looping, in the ordinary course of events, the aorta arises anteriorly from the right ventricle, and the pulmonary trunk arises posteriorly from the left ventricle. Although this condition satisfies the definition of transposition mentioned above and though it results in discordance of the normal ventricular-arterial relationship, septation of the truncus arteriosus in this manner appears to be normal in L-looping. In other words, otherwise normal development of the heart after L-looping includes transposition of the great arteries; therefore, it should not be considered an additional abnormality. The anatomy of the atria in ventricular inversion remains normal. The right atrium enters the left ventricle through a mitral valve that is anatomically normal. Left ventricular internal anatomy is normal, and the mitral valve is in fibrous continuity with its outlet valve, the pulmonary valve. The pulmonary trunk is central and posterior in position. The left atrium enters the right ventricle through a tricuspid valve that almost always demonstrates at least minor anatomic abnormalities. The outflow area of the right ventricle (ie, infundibulum) leads to the aortic valve located at the left upper heart border. The anterior ascending aorta rises more or less straight toward the midline and then passes to the left of the trachea, branching normally. Because of the abnormal relationship of the atria to the ventricles, the position of the AV node is abnormal (ie, above and to the left of its normal position). An accessory AV node may also be present. The bundle of His and the right and left bundle branches are inverted, a condition that substantially lengthens the main bundle. The coronary arteries usually have normal morphology but are distributed and named in accordance with the ventricles. Therefore, the left coronary artery arises from right posterior sinus and the right coronary arises from the left posterior sinus. In the absence of an additional heart defect the circulation in ventricular inversion is normal. Systemic venous blood passes from the right atrium to the left ventricle and then to the pulmonary arteries. Pulmonary venous blood enters the left atrium, passes into the right ventricle, and then enters the aorta. This physiology accounts for the terms congenitally corrected transposition and physiologically corrected transposition . However, these names emphasize transposition rather than ventricular inversion as the primary abnormality. Moreover, this distraction from the primary embryologic abnormality of looping makes understanding this defect more complex and more difficult than it otherwise is. The heart with ventricular inversion may have no other clinically significant abnormality. Therefore, the individual's cardiac function remains normal. However, this situation is the exception, occurring in less than 1% of all persons with ventricular inversion. The vast majority of hearts with ventricular inversion have associated defects. Any cardiac defect that can occur in a normal d-looped heart can occur in the heart with ventricular inversion. The most rare and most interesting associated cardiac defect observed in ventricular inversion is that which causes the pulmonary artery to arise anteriorly from the right ventricle and the aorta posteriorly from the left ventricle. In other words, the great arteries are reversed from their expected position for the heart with ventricular inversion. This condition causes systemic venous blood to travel from right atrium to the left ventricle and then to the aorta (ie, back to the systemic circulation); pulmonary venous blood enters the pulmonary artery returning to the lungs. Therefore, this situation is physiologically identical to simple transposition of the great arteries in D-looping. Some use the terms isolated ventricular inversion or ventricular inversion without transposition to describe these cases in which the pulmonary artery is anterior and the aorta posterior even though the physiology is that of simple transposition. One can make the argument that these hearts demonstrate 2 independent developmental abnormalities: ventricular inversion and transposition of the great arteries. In this case, the usual definition of transposition (ie, aorta anterior, pulmonary trunk posterior) does not apply. If transposition is defined as pulmonary artery posterior and aorta anterior, an admittedly useful definition, the heart with ventricular inversion, anterior pulmonary artery, and posterior aorta cannot be labeled as demonstrating transposition, though the aorta and pulmonary artery are reversed in relation to their expected positions. Some authorities call this heart atrial-ventricular discordance with ventricular-arterial concordance , but this term tends to obscure the combination of defects that appears to be present. Given the controversies in the terminology, it is prudent and important to concentrate on understanding this interesting defect and not to dwell on the issue of naming it. The natural history of ventricular inversion depends on the associated heart defect, if any. Many defects are stable. On the contrary, regurgitation of the tricuspid (left-sided AV valve) tends to progress and may cause right ventricular dysfunction more rapidly than a similar degree of mitral regurgitation in a noninverted heart causes left ventricular dysfunction. Data from a substantial multicenter study suggest that individuals with ventricular inversion have a long-term risk of developing both right ventricular myocardial dysfunction and congestive heart failure that is not directly related to the degree of tricuspid valve regurgitation. Furthermore, other reports indicate that right ventricular coronary blood-flow reserve is decreased in the absence of ischemic symptoms. Ventricular inversion accounts for approximately 0.5% of all congenital heart defects. Ventricular inversion occurs with VSD in 80% of cases and occurs with pulmonic stenosis (usually subvalvar) in 50%. Almost all patients have an associated anatomic abnormality of the tricuspid valve. Functional abnormality, usually tricuspid regurgitation, is present in approximately one third. Ventricular inversion is associated with some type of AV conduction abnormality in one third of patients. Associated positional abnormalities of the ventricular mass, mesoversion, and dextroversion are encountered fairly often. More complex defects (eg, single ventricle of the double-inlet left ventricle [DILV] type, often with coarctation of the aorta) also occur. As in the United States, ventricular inversion accounts for approximately 0.5% of all congenital heart defects. The prevalence is higher in males than in females, with a male-to-female ratio of approximately 2:1. Ventricular inversion is a congenital abnormality and therefore is present at birth. It may be diagnosed in persons of any age, including young infants. The defect cannot be acquired. It most commonly comes to attention because of associated heart defects, including complete heart block. Ventricular inversion without an associated defect may escape detection indefinitely. Ventricular inversion may be discovered on an ECG recorded during investigation of an innocent heart murmur. In rare cases, ventricular inversion is recognized on a plain posterior-anterior chest radiograph. Fetal echocardiography can identify ventricular inversion. Unolt M, Putotto C, Silvestri LM, Marino D, Scarabotti A, Valerio Massaccesi, et al. Transposition of great arteries: new insights into the pathogenesis. Front Pediatr. 2013 Jun 6. 1:11. [Medline]. [Full Text]. Kuehl KS, Loffredo CA. Population-based study of l-transposition of the great arteries: possible associationswith environmental factors. Birth Defects Res A Clin Mol Teratol. 2003 Mar. 67(3):162-7. [Medline]. Xie LX, Chen YS, Liu SY. A giant cardiac lipoma associated with ventricular inversion and ventricular aneurysm: ultrasonography and CT imaging findings. Chest. 2012 Jan. 141(1):241-4. [Medline]. Sharma R, Marwah A, Shah S, Maheshwari S. Isolated atrioventricular discordance: surgical experience. Ann Thorac Surg. 2008 Apr. 85(4):1403-6. [Medline]. Sharma R, Talwar S, Marwah A, et al. Anatomic repair for congenitally corrected transposition of the great arteries. J Thorac Cardiovasc Surg. 2009 Feb. 137(2):404-412.e4. [Medline]. Cui B, Li S, Yan J, Shen X, Wang X, Yang K, et al. The results of a two-stage double switch operation for congenital corrected transposition of the great arteries with a deconditioned morphologically left ventricle. Interact Cardiovasc Thorac Surg. 2014 Aug 30. [Medline]. Ly M, Belli E, Leobon B, Kortas C, Grollmuss OE, Piot D. Results of the double switch operation for congenitally corrected transposition of the great arteries. Eur J Cardiothorac Surg. 2009 May. 35(5):879-83; discussion 883-4. [Medline]. Anderson RH. The conduction tissues in congenitally corrected transposition. Ann Thorac Surg. 2004 Jun. 77(6):1881-2. [Medline]. Bautista-Hernandez V, Marx GR, Gauvreau K, Mayer JE Jr, Cecchin F, del Nido PJ. Determinants of left ventricular dysfunction after anatomic repair of congenitally corrected transposition of the great arteries. Ann Thorac Surg. 2006 Dec. 82(6):2059-65; discussion 2065-6. [Medline]. Beauchesne LM, Warnes CA, Connolly HM, et al. 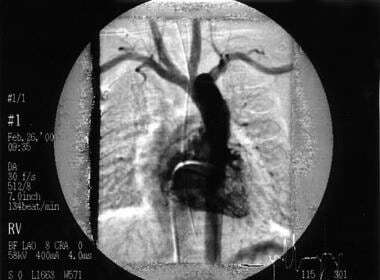 Outcome of the unoperated adult who presents with congenitally corrected transposition of the great arteries. J Am Coll Cardiol. 2002 Jul 17. 40(2):285-90. [Medline]. Bos JM, Hagler DJ, Silvilairat S, et al. Right ventricular function in asymptomatic individuals with a systemic right ventricle. J Am Soc Echocardiogr. 2006 Aug. 19(8):1033-7. [Medline]. Bove EL, Ohye RG, Devaney EJ, Kurosawa H, Shin'oka T, Ikeda A. Anatomic correction of congenitally corrected transposition and its close cousins. Cardiol Young. 2006 Sep. 16 Suppl 3:85-90. [Medline]. Buys R, Van De Bruaene A, Budts W, Delecluse C, Vanhees L. In adults with atrial switch operation for transposition of the great arteries low physical activity relates to reduced exercise capacity and decreased perceived physical functioning. Acta Cardiol. 2012 Feb. 67(1):49-57. [Medline]. Carlson B. Prenatal Diagnosis of Congenitally Corrected Transposition of the Great Arteries. J Diag Med Son. May 2007. 23:153-6. Connolly HM, Grogan M, Warnes CA. Pregnancy among women with congenitally corrected transposition of great arteries. J Am Coll Cardiol. 1999 May. 33(6):1692-5. [Medline]. De La Cruz MV, Anselmi G, Cisneros F, et al. An embryologic explanation for the corrected transposition of the great vessels: additional description of the main anatomic features of this malformation and its varieties. Am Heart J. 1959 Jan. 57(1):104-17. [Medline]. Doksoz O, Oner T, Guven B,et al. Mid-term assessment of cardiac autonomic functions in children with transposition of the great arteries after arterial switch operation. Anadolu Kardiyol Derg. 2014 Dec. 14(8):735-40. [Medline]. Duncan BW, Mee RB, Mesia CI, et al. Results of the double switch operation for congenitally corrected transposition of the great arteries. Eur J Cardiothorac Surg. 2003 Jul. 24(1):11-19; discussion 19-20. [Medline]. Graham Jr TP, Markham L, Parra DA, Bichell D. Congenitally Corrected Transposition of the Great Arteries: An Update. Curr Treat Options Cardiovasc Med. 2007 Oct. 9(5):407-413. [Medline]. Graham TP Jr, Bernard YD, Mellen BG, et al. Long-term outcome in congenitally corrected transposition of the great arteries: a multi-institutional study. J Am Coll Cardiol. 2000 Jul. 36(1):255-61. [Medline]. Hauser M, Bengel FM, Hager A, et al. Impaired myocardial blood flow and coronary flow reserve of the anatomical right systemic ventricle in patients with congenitally corrected transposition of the great arteries. Heart. 2003 Oct. 89(10):1231-5. [Medline]. [Full Text]. Helvind MH, McCarthy JF, Imamura M, Prieto L, Sarris GE, Drummond-Webb JJ. Ventriculo-arterial discordance: switching the morphologically left ventricle into the systemic circulation after 3 months of age. Eur J Cardiothorac Surg. 1998 Aug. 14(2):173-8. [Medline]. Ismat F, Baldwin H, Karl T, Weinberg P. Coronary anatomy in congenitally corrected transposition of the great arteries. Int J Cardiol. December 2002. 86:207-216. [Medline]. Kozelj M, Prokselj K, Berden P, et al. The syndrome of cardiac failure in adults with congenitally corrected transposition. Cardiol Young. 2008 Dec. 18(6):599-607. [Medline]. Ma K, Gao H, Hua Z, Yang K, Hu S, Zhang H, et al. Palliative pulmonary artery banding versus anatomic correction for congenitally corrected transposition of the great arteries with regressed morphologic left ventricle: Long-term results from a single center. J Thorac Cardiovasc Surg. 2014 Jan 15. [Medline]. Manesis EK, Cameron CH, Gregoriadis G. Hepatitis-B-surface-antigen-containing liposomes enhance humoral and cell-mediated immunity to the antigen [proceedings]. Biochem Soc Trans. 1979 Aug. 7(4):678-80. [Medline]. Mullins CE. Ventricular inversion. Garson, A, Bricker, JT, McNamara, D, eds. The Science and Practice of Pediatric Cardiology. Philadelphia, PA: Lippincott Williams and Wilkins; 1990. 1525-38. Scherptong RW, Vliegen HW, Winter MM, Holman ER, Mulder BJ, van der Wall EE, et al. Tricuspid valve surgery in adults with a dysfunctional systemic right ventricle: repair or replace?. Circulation. 2009 Mar 24. 119(11):1467-72. [Medline]. Schiebler GL, Edwards JE, Burchell HB, et al. Congenital corrected transposition of the great vessels: a study of 33 cases. Pediatrics. 1961 May. 27(5)Suppl:849-88. [Medline]. Shin'oka T, Kurosawa H, Imai Y, Aoki M, Ishiyama M, Sakamoto T. Outcomes of definitive surgical repair for congenitally corrected transposition of the great arteries or double outlet right ventricle with discordant atrioventricular connections: risk analyses in 189 patients. J Thorac Cardiovasc Surg. 2007 May. 133(5):1318-28, 1328.e1-4. [Medline]. Tobler D, Williams WG, Jegatheeswaran A, Van Arsdell GS, McCrindle BW, Greutmann M, et al. Cardiac outcomes in young adult survivors of the arterial switch operation for transposition of the great arteries. J Am Coll Cardiol. 2010 Jun 29. 56(1):58-64. [Medline]. Tulevski II, Zijta FM, Smeijers AS, et al. Regional and global right ventricular dysfunction in asymptomatic or minimally symptomatic patients with congenitally corrected transposition. Cardiol Young. 2004 Apr. 14(2):168-73. [Medline]. Victorica BE, Miller BL, Gessner IH. Electrocardiogram and vectorcardiogram in ventricular inversion (corrected transposition). Am Heart J. 1973 Dec. 86(6):733-44. [Medline]. Winter MM, Bernink FJ, Groenink M, et al. Evaluating the systemic right ventricle by CMR: the importance of consistent and reproducible delineation of the cavity. J Cardiovasc Magn Reson. 2008 Aug 19. 10(1):40. [Medline]. [Full Text]. Yarrow S. Anaesthetic management of labour in congenitally corrected transposition. Int J Obstet Anesth. 2008 Jul. 17(3):280-1. [Medline].